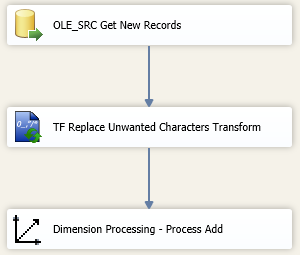 Recently I was using the Dimension Processing task inside of SSIS to perform a process add to one of my dimensions. I then found out that I had some bad data, more specifically, I had some invalid XML characters in my source data and this was causing the dimension processing task to fail. Below is a screenshot that includes the invalid character, after Mitchell before =. I needed to remove invalid XML characters from source data so that I could use the dimension processing task to perform a process add on the dimension. Sadly, I originally began this process by trying to write my own script transform to remove the invalid XML characters. Unfortunately the script I was using (Found on the internet) apparently did not account for all characters as my processing task continued to fail with the same error. So what did I do? I turned to Task Factory of course! To solve this problem I used the Task Factory replace unwanted characters transform. Next open up the Task Factory component and you will see a list of your columns on the left. 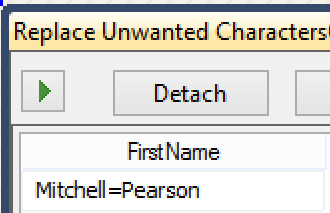 Select “Replace invalid characters that cannot be part of an XML Document. Now when I execute my package you will notice the illegal XML character is gone! Thank you Task Factory Team!